Halloween has come and gone, and I’m curious to know how things went for those of you who have younger kids. Our house has never gotten very many trick-or-treaters, and this year was no exception. We did get a dozen or so, though, which for us isn’t bad. I was very surprised, and pleased, to see that just about all of the trick-or-treaters that came to our house were pretty young. The one “older” group we got appeared to be middle-school-aged, which is still fine in my book. Typically we get a few high-school-aged kids, but not this year. Perhaps it was because we turned off the lights around 9:00 p.m., and the high-schoolers typically come on the late side of the evening. But even the younger kids came later than I expected; we often get a group or two while it is still somewhat light out, and this year we did not. It was fully dark when our doorbell rang for the first time that evening. I did learn of a couple of houses I perhaps should have included in last week’s brief roundup of decorated homes; I’ll have to check them out next year and see what they are doing. Reader Jack noted the house on Iris near Whipple. This is a house I should have remembered to check on myself, given that I had photographed it last year and really liked it. Their decor featured a life-sized circle of witches standing on the front lawn; it was really top-notch. Thanks to the San Mateo Daily Journal I learned about the house over on Topaz between James and Harding. This year their decorations featured a “man-eating” wreath with moving teeth and eyes mounted under the eaves of the garage. Along with other decorations and a synchronized light-and-music show, it really was impressive. As I was driving to a friend’s house on Upland (during the day) I noticed a home that had some Lord of the Rings themed decor: they had one huge spider in their front yard, plus a very large spider overlooking Frodo, who was completely wrapped in spider silk. Even in the daytime this display looked a bit scary — but it was extremely well done. I plan to make it a point to check on these three houses next year, along with the others I wrote about last week; I’m guessing that anyone who went to this much trouble this year is likely to do something equally good (or even better!) next year. 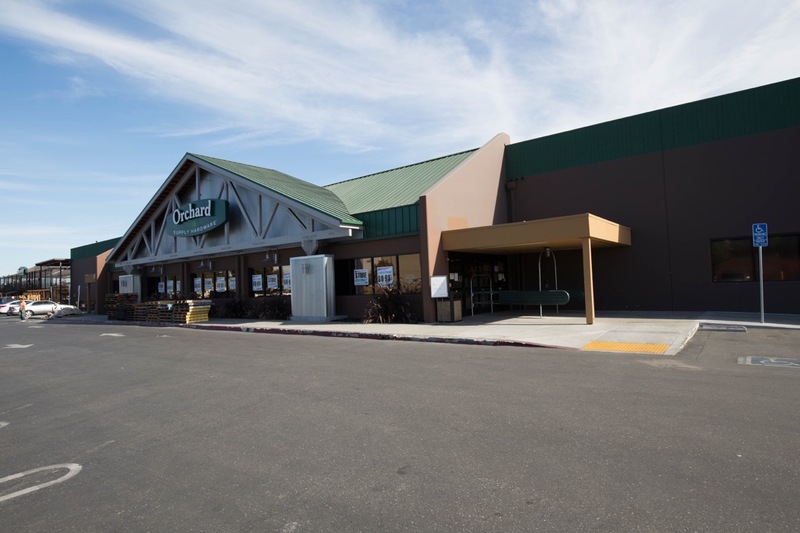 Switching gears, I had an appointment at the Palo Alto Medical Foundation’s San Carlos facility on Thursday, and afterwards decided to drop in on the San Carlos Orchard Supply Hardware store, which is directly across the street from the PAMF facility. I was hoping to pick up a light bulb to replace one that had gone bad at my home. The current state of the San Carlos store got me curious about the Redwood City store, so I paid them a visit this week. I had assumed, based on no information whatsoever, that our store might be sticking around a bit longer, but no. Their signage is a little confusing, though. A temporary sign out near Middlefield Road indicated that the store would be closing by the end of this weekend but signage on the store’s front windows indicated that the store would be open for nine more days. Whichever it is, the same sale is going on in our Redwood City OSH, with every remaining item 60-90% off. And all of the shelves, rolling ladders, and other fixtures are priced for sale as well. Redwood City’s store has a bit more inventory than the San Carlos store, although most of the good stuff — like lightbulbs — is gone. But ours seemed a bit more organized, and still had a bit more stuff on the shelves (those that weren’t taped off; some sections of our store are taped off much like in San Carlos). I noted Christmas Tree stands for $40, and all of the demonstration sink faucet sets were also on sale for $40. So there are some good deals to be had for the right person. Just don’t expect to go in with a list of specific items; you likely won’t find what you are looking for. Some months ago, when the company leadership announced that all of the Orchard Supply Hardware stores would be closing, I started thinking about what our soon-to-be-empty store could be used for. Our store was remodeled about two-and-a-half years ago, just about the same time that the San Carlos store was built (in April of 2016). So the building should be in pretty good shape, and could easily be repurposed. My first thought was to turn it into a gym, but we don’t seem to need any more of those. I gave brief thought to a related idea that a friend of mine suggested some years back: he was focused on the K-Mart property out on Veterans Boulevard, and thought that if K-Mart ever went under perhaps that property could be turned into a park. K-Mart is still hanging in there, but with OSH shutting down I considered whether the building should be torn down and the property (including much of the surrounding parking lot) be used for a park. Although I’m always up for more parks, the fact that the building was so recently remodeled keeps coming to mind: I would hate to see such a nice building be wasted in that way. And then it hit me. What does Redwood City need more of? Housing. In particular, cheap housing. 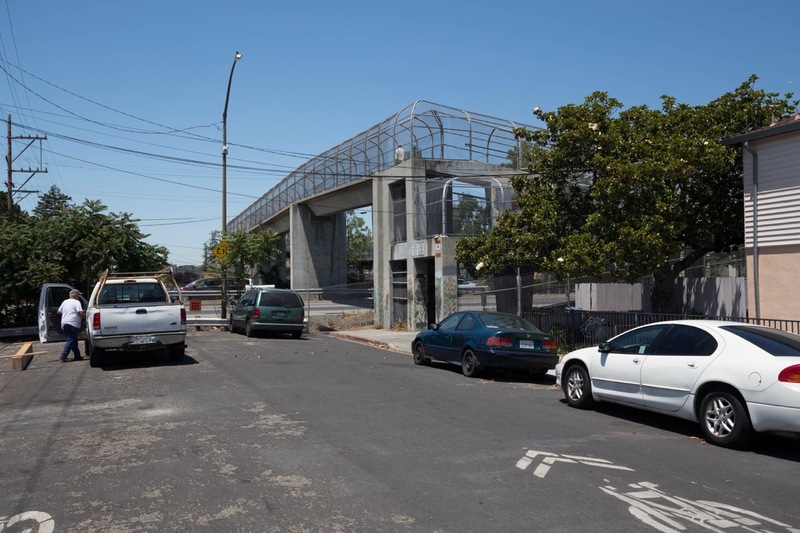 This site, across a parking lot from Costco and close to the intersection of Middlefield Road and Woodside Road — which means that freeway access is relatively easy, as is access to Redwood City’s downtown — would work great for housing. Across Middlefield Road there is plenty of single-family and multi-family housing, so an apartment building wouldn’t be out of place here. Hoover School is only about a block away, and the giant Hoover Park is just on the other side of the school. In addition to Costco, where residents might get some of their groceries, Sigona’s is just across Middlefield Road from Costco, making some shopping, at least, a short walk away. Walking to and from this location, incidentally, is just about to become much easier, thanks to the nearly complete Middlefield Road and Woodside Road Intersection Improvements project. This project is bringing crosswalks and new signals to this busy intersection. Previously, in order to cross here you had to walk a block over to Stambaugh Street, then up and over the over-crossing structure, then walk the block back to the intersection. Previously, the intersection of Middlefield Road and Woodside Road didn’t have marked crosswalks or signals that took pedestrians into account. In just a couple of weeks, it will. By now you are probably envisioning replacing the OSH building with a multi-story apartment building of the type that you see going up along El Camino Real these days. But that’s not what I have in mind. Recall that I mentioned that what we need is “cheap” (well, inexpensive) housing. 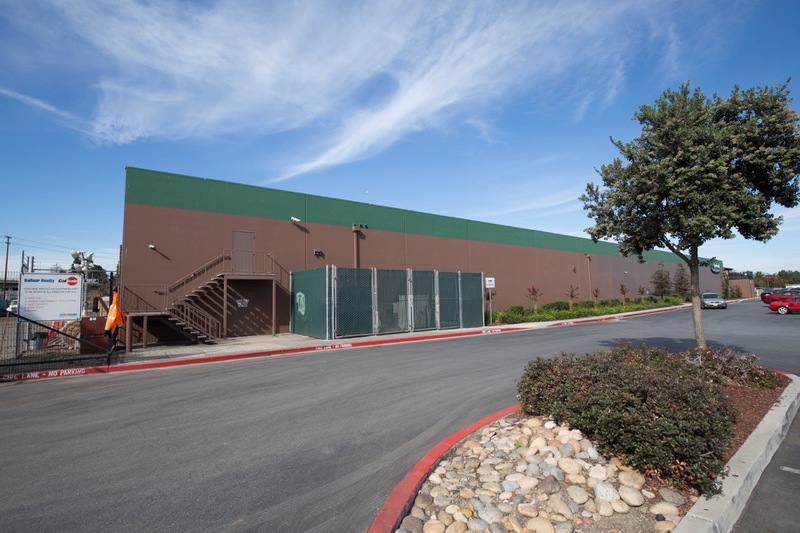 And consider what surrounds the OSH building right now: the Caltrain tracks are on one side, Costco (in particular, the giant Costco gas station) is on another, Middlefield Road is on the third side (along with a Burger King restaurant), and a mini-storage facility is on the fourth. While the area is actually fairly nice, those surroundings don’t scream “luxury housing” to me. And then there is that recently-remodeled building. No, what I’m thinking is this: how hard would it be, really, to simply retrofit the existing building and turn it into housing? Not a single window in sight. But fortunately, the building’s walls appear to be made of solid concrete, and thus I suspect that windows could be cut into it without affecting the building’s structure too drastically. 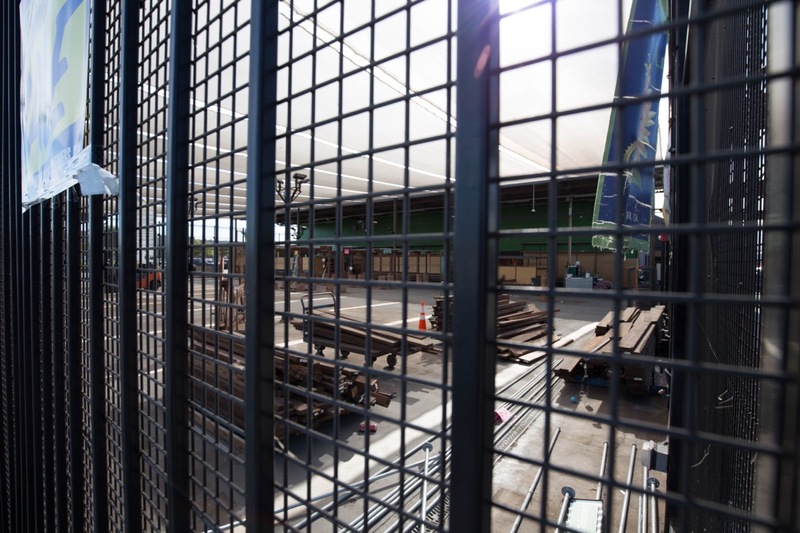 While the view out these windows wouldn’t be the greatest — some would look out at the Costco gas station, while others would look at the Caltrain tracks — at least you’d have natural light. Given the dimensions of the building, it would only make sense to put the apartments (I presume that these would be for-rent apartments) around the perimeter of the building. What to do with the empty center, then? I’m thinking atrium. Cut open the roof in the center of the building and let the sun in. By arranging the apartments with their main entrances and living room windows facing into this atrium, a lot of the views would be ones that could look into a well-landscaped atrium. As for those windows piercing the outer walls, some would be frosted windows allowing light into bathrooms — where the view is irrelevant — and others would be bedroom windows. Finally, we come to the issue of plumbing. I’m pretty sure that there is a lot of electricity coming to this building (and I’d add solar panels to the flat roof to bring down the building’s electricity costs) but a hardware store just doesn’t need nearly as much water — and drainage — as an apartment building does. Running pipes to each apartment unit is going to involve cutting into the building’s concrete slab, which, to keep things cheap, I’d love to avoid: perhaps the unit floors could be raised up so that plumbing and drainage could be routed above the slab but below the unit floors. That would likely be a lot cheaper than cutting the slab for the water lines and drain lines. I’m not an architect, so I don’t really know how feasible this is, or what it would ultimately cost. But it seems to me that we have a building that just might go on the market for a low price — I’m just not sure who else is going to want it — and if the building’s envelope can largely be preserved, it would keep the costs down tremendously. Finally, the last major cost of a typical multi-family residential project — the parking garage — is not needed here, since there is plenty of surface parking that could be used by the building’s residents. 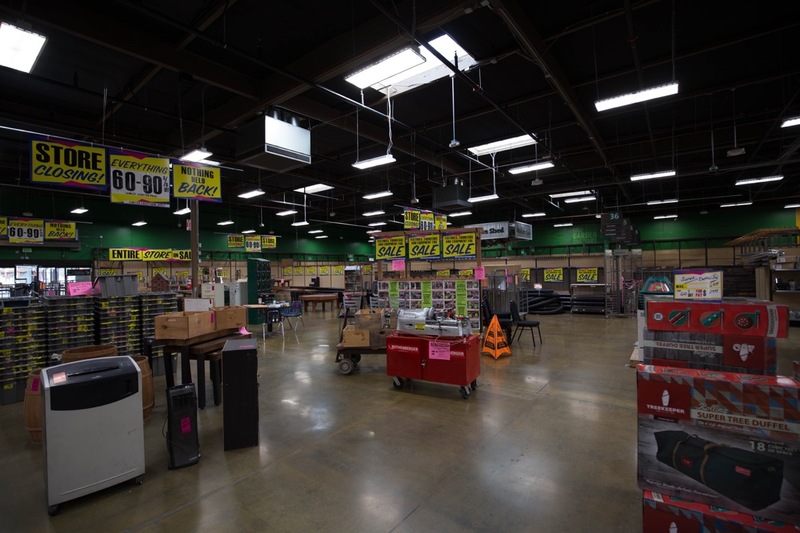 When I first heard that Orchard Supply Hardware was shutting down, I immediately thought about the Redwood City building that OSH had so recently remodeled, and what would become of it. The thought of that building just sitting empty saddened me, but the possibility of turning it into much-needed reasonably priced housing (well, reasonable for the Bay Area, anyway) cheered me up considerably. We need some out-of-the-box thinking to solve our housing crisis, and just perhaps buildings such as the soon-to-be-empty Orchard Supply Hardware building are part of the solution to our problem. I, for one, can’t wait to see what happens next on this site. When I see the shiny clean floor in the photo of OSH RWC, I think how nice it would be to have another roller rink to replace the one that left on Main St.
Or, perhaps a giant toy store to replace ToysRus that left. Isn’t there already low income affordable housing going in 3-4 blocks north at Bay & Woodside? I’d like to see the OSH building preserved and new retail go in there. No one should live next to Costco gas station with all the idling cars. As for the K-Mart on Veterans, you would think with the bankruptcy of the parent company Sears Holding, it’s just a matter of time before it closes its doors. I was just there to buy Halloween stuff, and it’s just not kept up with Target or Walmart. I don’t see how it keeps surviving. In its place, this would be a better location for more housing or a new hotel.